A novel in verse by Aaron Poochigian, now available for order from IndieBound or from Amazon. This book had me hooked right away! I foolishly started reading it before bed on Sunday night so I didn't get much sleep nor did I want to leave it at home when I went to work. I knew I couldn't read at work either so I ended up calling in sick which I don't even do when I'm sick. Obviously I would recommend this book to you considering I liked it so much. Written by Aaron Poochigian — Epic crime novels written in verse don’t come along too often and Poochigian has written a remarkable book. It is ablaze with vivid imagery, memorable turns of phrase and lyrical flights of fancy. It is a genre-bending work of art that demands your full attention. In Mr Either/Or an FBI agent with a double identity as a student is involved in dealing with dangerous mythological artifacts, gang wars, bloody fights and battles with aliens. He's constantly under threat and tumult is always looking for him. However, there's an intriguing art historian who's often by his side. Therefore he must have the time for romance, while simultaneously trying to uncover evil plots against him and the people living in his city. Columbia U. School of the Arts on "Mr. Either/Or"
Etruscan Press recently published a novel by Aaron Poochigian '16. 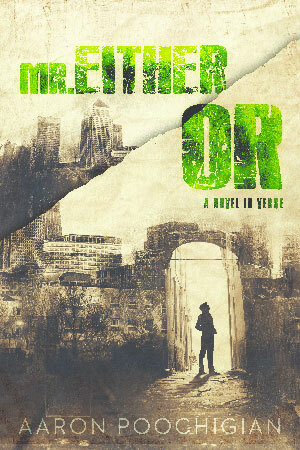 A novel in verse, Mr. Either/Or blends American mythology, noir thriller and classical epic into “gritty rhythms, foreboding overtones, and groovy jams” that lends it a surreal air. The 184-page novel has already received accolades from readers. Read more about Columbia U. School of the Arts on "Mr. Either/Or"
Read more about The Bookchemist's video review of "Mr. Either/Or"! Read more about In "Mr Either/Or" words "leap off the page"